Tea Party Nation is just one group and a controversial group at that. But Boehner's plan is under attack from plenty of other conservatives, too. 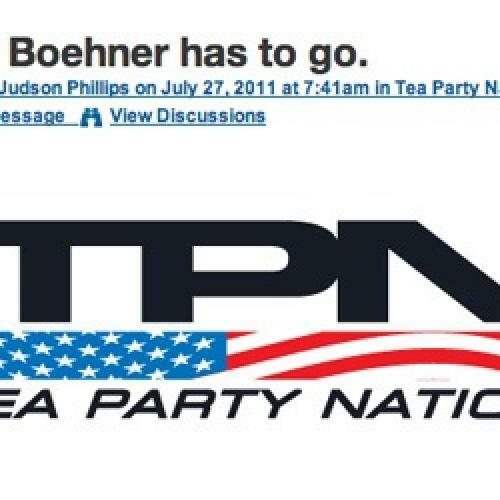 Given Boehner’s background, you would think he would be right up there with theTea Party. Instead of being the best Speaker in the last century, which he could have been, he has turned into a total disaster. What is wrong with Boehner? Much like the French Army, Boehner surrenders early and often. Our country deserves better and the conservative movement cannot take any more of this. We must act. When the GOP first came into power in January, they promised $100 billion in cuts for this year. Then that number kept shrinking until very rapidly the GOP saw a TeaParty revolt. Boehner then turned around, gave lip service to supporting budget cuts and then gave us a budget cut for this year of not $100 billion but $352 million. By any standards, that was an epic fail. Now Boehner is in the process of surrendering again. He is surrendering not to Obama, but to the status quo in Washington. The House passed Cut, Cap and Balance, which would cut $111 billion from the budget. It would cap spending and set a good course for the future. Now, Boehner has set a new plan that would only cut only $7 billion. Even the wishful thinking of his plan was shot down by the Congressional Budget Office which said even over ten years his budget would not save that much money. In fact, the savings were so low that Boehner has had to pull the bill to rewrite it. Boehner has no real interest in solving the problems this country faces. He might have been a decent Speaker of the House in another era where he just needed to manage legislation for a Republican President. Unfortunately for us, Boehner is a big government Republican. He worships at the altar of massive spending. We need a Speaker who is a leader. We need someone with courage and vision. Boehner has none of those qualities. He is not a leader. The Daily Caller today quoted a senior GOP staffer who compared John Boehner to a used car salesman. John Boehner simply wishes to be the manager in chief of the welfare state. His vision of the GOP and the Speakership involves golfing, drinking and not rocking the boat. America is at a crisis point. Many of the credit ratings agencies are not only concerned about America defaulting on the debt, but many have also expressed strong concern about the unmanageable size of America’s debt. They have concerns about America’s uncontrolled spending. John Boehner only seems concerned about his next cigarette break. America cannot stand a lack of leadership. We have that from both the White House and the Senate, who have not proposed any plans. We cannot have a lack of leadership from the GOP controlled House of Representatives, which is exactly what we have with John Boehner. Today, we need to contact our Representatives again. We need to tell them not only not to support the Boehner non-plan but also tell them Boehner has to go as Speaker. In 2006 and 2008, the GOP sailed to oblivion. The Tea Party is the only thing that saved the GOP. If left to their own devices, the GOP establishment would have the GOP as a minor liberal party, compared to a permanent liberal majority party, the Democrats. We need a Tea Party Speaker of the House. We need a Speaker with a vision for the future. We need a Speaker who not only understands the desperate need to cut spending now, but who has the willingness to fight when we need to and not haul up John Boehner’s freshly laundered white flag of surrender. We need a Speaker who understands that compromise is not the goal. Solving America’s problems is the goal. Compromise is a tool to achieve those goals. So is fighting. We need a Speaker with courage, vision and the willingness to fight. In short, we need someone who is not John Boehner. It is time to make our voices heard and it is time to tell the Republicans Boehner has to go. Our message to the GOP House members is simple. We put you in power in Washington. Now you need to put a new Speaker in power in the House.